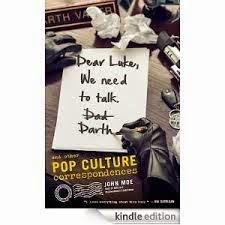 My second book choice for Blogging For Books was John Moe's Dear Luke, We Need To Talk, Darth. This sounded like such a fun book to me, I am a huge fan of written correspondence, my pen pals regularly get pages (yes pages) of me rambling about absolutely nothing. Well almost nothing, Cat's doll preference, annoying moms at parties, cosplay plans, you know the same stuff I blog about but in more detail. So I somehow assumed that a book about fictional pop culture correspondences would be interesting. You know what they say about making assumptions. I just didn't love this book and I feel bad for not liking it. If I had read it ten years ago I probably would have loved it, or at least parts of it. There are certain parts of it I would have still felt were a waste of my time to read. The thing that didn't work about this book for me is that I am an Internet addict, so I read a great deal of pretty witty pop culture correspondence stuff EVERY SINGLE DAY. Things like Texts From Superheros, some of which are brilliant and stick with you days or weeks later. It's my opinion that if you are going to make a book out of these things than all your stuff needs to be that witty, this is not up to that level. That's not to say that there weren't great parts in there, because there were, they just seemed to be very spread out. There were somethings in there that just seemed to be filler too, that struck me as a little weird. Disclaimer: I received this book free from Blogging For Books in exchange for an honest review.